Recently a demonstration of the advanced capabilities of an A5 robotic system took place at the Southwest Research Institute in San Antonio. The system is the first multi-purpose robot designed for the use on the aerospace factory floor. The robot is anticipated to cut maintenance times for aircraft coating removal up to 50%. 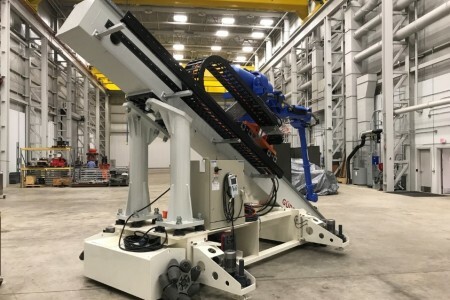 According to Rick Meyers, an Automation and Robotics Program Manager at the AFRL, the A5 robot is mounted on a mobile platform that allows it to move about an aircraft. A human operator interfaces with the onboard computer and the robot plans and completes the manual tasks. By the used of advanced sensors a real-time path planning and analysis is possible. Thereby the A5 is enabled to adapt to multiple platforms without the need for system reprogramming. The exhausting chore of sanding could be covered by the robot in future. A video of the working robot can be found here.